We offer three different styles of Café Banner – Primo, Medio and Espresso. The Primo and Medio use two different methods of attaching graphics, either “slide-in” or “wrap over”; the Espresso is available as the “wrap over” option. 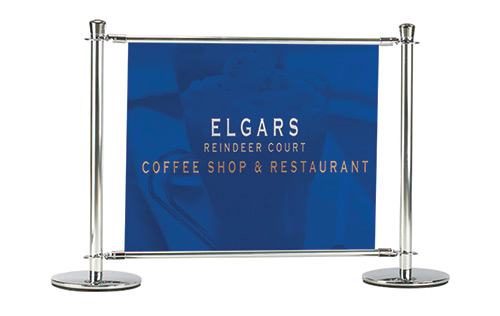 The Café Banner posts vary in weight from 10.5kg up to 18kg. All three styles have cross bar lengths available in 2000mm, 1500mm and 1200mm. Please phone 0800 999 KWIK and ask for further details to be emailed to you. FAST – We can design and print Banners in 2 to 3 days. LOCAL – We can visit clients’ premises at short notice. Free local delivery is part of our service - or you can collect from our centre in Clarence Street. We have a car park for customers’ use behind the centre.